Knowing all this, imagine a local vaccine enforcer holding down a screaming child by force, jabbing it with an autism-causing toxic brew of aluminum, mercury, formaldehyde and squalene (all ingredients in modern vaccines) while a police officer holds the mother at gunpoint. You forgot one. I will add it for you. HAVING YOUR KID LIVE! SO WHERE IS YOUR "PROOF" THAT ANY OF YOUR KIND'S ARGUMENTS ARE TRUE? DO NOT SAY THAT 5 MINUTES ON GOOGLE AS "RESEARCH". GUESS WHAT YOU HAVE? YOUR VACCINATIONS! How old are you? And have you attended a public school? I need not entertain you, because no means no.... this is fun for debate, but the bogtom line is nobody has more rights than another. You will not control me. Period. I have been to public school, but my parents paid taxes and made decisions just like i will.. my mother is a Nurse in charge of a huge children's hospital. Im a veteran twice deployed. The cdc wants to kill Americans... i am most importantly a father. And Jesus took my diseases on that cross so i don't have to... . I find usefulness in rusty metal, but not much in talking to a victim of mass media brainwashing as yourself. We are in a war. They want America to be demoralized and dead. look at these, and tell me you know more than F**KING DOCTORS! Your kids will die just like Jesus, with a rusty nail. 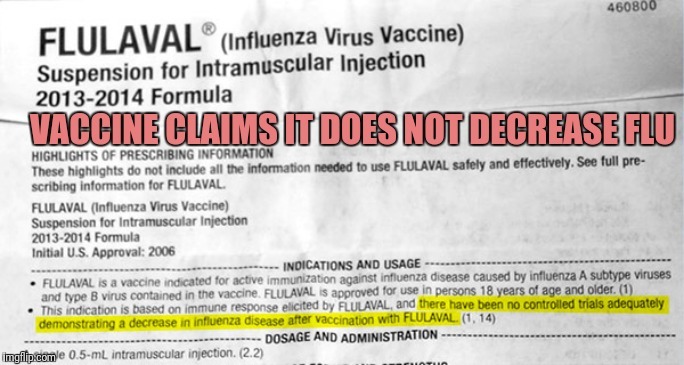 AND THE F**KING VACCINES DOES NOT LOWER THE FLU, IT HELPS THE KID NOT F**KING DIE!